Continue reading Research : Hispanics shop more online than average Web user and shop earlier in holiday season. Amazon in retail stores doing experiment with physical store location. Continue reading Amazon tries two-week mall kiosk experiment. 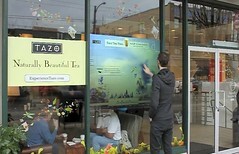 The digital storefront is part repurposed, part custom technology. What consumers see is a large digital image with a touchscreen area showing the products for sale. After customers choose a product, they enter their mobile number (the entered digits are hidden, but the touchpad is fairly visible, so if you're not careful people around you can see you entering your number), and complete their purchase on their smartphones. Continue reading eBay Experiments with Virtual Digital Storefronts in Malls. Nice article by Ron Bowers - As a company devoted to improving physical store environments and customer experience we embrace the authors' point that "stores can't simply be places where products happen to be sold." Future store configurations will have to be places that promote customer learning and experimentation. Continue reading Store Environments Designed For Retail Survival. Home Depot is acting more like a multichannel retailer and less like a home-improvement warehouse. Plus strategic purchase of BlackLocus and RedBeacon. Continue reading How Home Depot Mastering Multichannel Sell Strategy. Can Sears Break The Pattern? NY Times article discussing Sears Eddie Lampert good and bad. After spending so little on stores the key is new Shop Your Way program (loyalty). Objective - transform Sears Holdings from a company focused on running stores and selling products to a company more focused on serving members. Continue reading Can Sears Break The Pattern?. Is it a Multi-Channel or an Omnichannel Customer Experience? There is increased chatter about omnichannel, but many companies may not understand the difference between omnichannel and multi-channel. 7 recently spoke with a panel of industry experts to get their perspective on multi-channel and omnichannel. Continue reading Is it a Multi-Channel or an Omnichannel Customer Experience?. British electrical retailer Dixons Retail opened its first store in a series of new concept stores for its travel brand Dixons Travel at the South terminal of London's Gatwick Airport. Unlike traditional POS (point of sale) format stores, the new 1,466 ft2 space features digital signage to showcase latest products and information. Continue reading Dixons Retail opens first new concept store at Gatwick Airport. Continue reading Cabelas Digital Signage Review. Dozens of 6-foot-4-inch stainless-steel kiosks are to be installed in 19 subway stations in the next few months in what the Metropolitan Transportation Authority calls its "On the Go! Travel Station" program. They will replace some of the poster-size paper maps on platforms, mezzanines and turnstile areas, and also cut down on notices that sometimes proliferate to the point that they look like wallpaper. Continue reading Subway Kiosks Will Guide Riders (in Between Ads). Adidas in Nürnberg, Germany, is currently experimenting with an interactive storefront that brings window shopping to the next level. The window displays a "fully functioning virtual store with life-size products" where shoppers can point and drag items onto virtual mannequins to see how it would look. Continue reading Adidas Interactive Storefront Lets Shoppers Play Dress-Up With Virtual Mannequins. Multimedia designer Excogitare and digital signage solutions manufacturer friendlyway recently worked with BMW dealerships across Italy to replace their paper point-of-sale displays with interactive digital signage kiosks, according to an announcement from Excogitare. Continue reading BMW Italy deploys digital signage kiosks in showrooms. Chicago-based Elevate Digital, which was until recently known as smartDigital, is the maker of street-level interactive kiosks that integrate social media and advertising. It has partnered with Groupon, the Chicago Tribune and Metromix. Continue reading Interactive kiosk start-up Elevate Digital lands $2.7M. almart donated 20 42-inch TVs to get the program started, he said. So far, seven truck stops in Colorado have the kiosks, and he hopes to have more than 30 participating within the next 12 months. Truck stops are always one of the first it seems. Continue reading New highway information kiosks debut at Loveland-area truck stop. Dave Haynes is founder and editor of Sixteen:Nine blog and previews Infocomm and what Elotouch (can we say that now?) will be showing. Looks like big intro for 55 inch touch though I'd like to see the full Cisco telepresence demo. Continue reading Elo Filling InfoComm Booth With Real World (Yay!) Touch Applications. Four Winds Interactive looks set to strengthen its presence in the casino digital signage market after signing a deal with JCM Global that will make Four Winds products available to JCM's customers. Continue reading Digital signage in gaming: Four Winds Interactive gains access to JCM casino clients. The release of ArmorActive's new line of acrylic iPad kiosks follows shortly after well received custom iPad kiosk design project with Foot Locker. The new acrylic line offers a variety of options including credit card swipe, custom colors and branding features. Continue reading After Successful Foot Locker iPad Kiosk Launch, ArmorActive Releases New Line of Acrylic Enclosures. Family Dollar Store has selected AccessVia Web dSignShop Software as a Service (Saas) to print shelf-edge signs and labels in stores. The enterprise cloud-computing model delivers both sophisticated and scalable signing systems. The discount retailer required a solution that could handle high sign-printing volume across its 7,100 stores in 45 states. Continue reading Family Dollar Deploys Cloud-Based Signage SaaS. Showcase article on Avnet and new technology being developed including Intel AIM Suite incorporation. Continue reading Seeing is believing on Avnet digital signage tour. The face of commercial signage is about to be transformed, experts say, and Phoenix-based Avnet Inc. is hoping to lead the revolution. Electronics-industry analysts predict that by 2015, about 22 million traditional signs in grocery stores, shopping malls, restaurants, health clinics and other businesses will be replaced with digital displays that interact with consumers in various ways. Continue reading Avnet shows off digital signs that interact with, monitor viewers. TE (Tyco Electronics) decides to divest the Touch group (Elo TouchSystems to most of us) for $380M. Estimated 2011 revenues were $411M for Elo. Purchased by the Gore Group which spent $1B (or so) on PEP Auto Stores. Interesting. Continue reading TE Connectivity Announces Agreements to Sell its Touch Solutions and Professional Services Businesses. Despite all the buzz around showrooming and mobile shopping, retailers will be relieved to know that brick-and-mortar stores are still important for 90 percent of shoppers, according to a study published by the e-tailing group and online local media company Local Corporation. Continue reading Study: Kiosks, digital signs can help keep consumers in store. Customer Engagement World (also KioskCom) is coming up in San Francisco at the end of this month. Recommended. Visit website for more information. Worth noting: When shopping in-store, 70 per cent of consumers agree that shops are great for when you want to talk to someone, 73 per cent state shops are good for experiencing items before they buy and 69 per cent agree that going into store is a secure way of shopping. Continue reading Survey reveals shopper's multi-channel habits. Imagine browsing knife sets in an airport and then ordering one before you board your plane, or going to a department store to look at makeup without having to bounce from counter to counter to check out each brand's selection. Continue reading Touch-screens create online shopping experiences at stores. McDonald's franchise owners often are as savvy as brand executives, and perhaps a shade more entrepreneurial. Witness the case of the owner of three McDonald's franchises in suburban Dallas-Ft. Worth, whose better-for-you innovation could ripple throughout the chain. Continue reading Meet the McDonald's Nutrition-Information Kiosk, Texas Style. An ALL Kids Insurance and Medicaid enrollment kiosk has been setup in the hospital's Emergency Room. If a child doesn't haven't insurance, parents can use the kiosk to submit an electronic insurance application to see if their child qualifies for ALL Kids. Continue reading New kiosk provides easy children's insurance enrollment. SAN FRANCISCO -- Ecast Inc. shut down its jukebox music network on March 1, a company spokesman confirmed. The San Francisco-based technology firm's board of directors voted for an immediate shutdown after the company failed to raise enough capital to continue operating. Continue reading Ecast Shuts Down Jukebox Network On March 1. Lufthansa has introduced four new self-service check-in kiosks at Mumbai International Airport. Continue reading Lufthansa brings self-service to Mumbai. Shoppers may soon see retail employees patrolling store aisles looking like Star Trek officers carrying tablet computers. More than half of retailers surveyed by RIS News are testing in-store tablets in 2012. Continue reading More than half of retailers testing in-store tablets. er wonder which touch screens in which locations are the dirtiest, and subject to germs & bacteria. This is first report we have ever seen and it's a little shocking. Continue reading Germs on touch screens: ATMs, airport kiosks, others put to the test. Continue reading Kiosks Bring Online Convenience to Stores . Continue reading NRF 2012: Digital in-store media called to deliver, Pt. I (Commentary). iosks are helping fans make digital keepsakes of their 2012 Super Bowl experiences. Four kiosks in the Super Bowl Village allow fans to record videos or send a digital postcards. The kiosks post the videos to YouTube and the digital postcards to Flickr. Continue reading Kiosks score big at Super Bowl Village. Digital Signage market stats - Are the stats good? From Wirespring & Bill Gerba -- Digital Signage Market Stats: Too High, Too Low or Just Right? Continue reading Digital Signage market stats - Are the stats good?. ouncepad and 192 terminals in London. Terminals are Samsung tablet units in special combination steel and plastic. Continue reading Kiosk enclosures put London on a pedestal. bull, CT, January, 25, 2012 - Customer Engagement Technology World (CETW) is pleased to announce Brian Solis, a world-renowned author on new media and Principal at Altimeter Group, as the opening keynote of its event on Wednesday, March 28, 2012 at the Moscone Convention Center in San Francisco. Continue reading Brian Solis To Deliver Opening Keynote At CETW San Franscisco. ith 100 more. From Chicago Sun Times. Continue reading Groupon launches kiosks to provide access to extremely local deals. WARWICK, R.I. (WPRI) - Today state officials unveiled a new tool designed to make traveling in Rhode Island even easier. he new interactive kiosk is located inside the Interlink at T.F. Green Airport in Warwick. Its situated right outside the car rental area in the connector walkway. Continue reading New interactive kiosk at TF Green Rhode Island airport. Company profile -- Watch Fire digital signs. Color and monochrome LED signs. Made in USA. Continue reading Company profile - Watch Fire Digital Signs. VER, Dec 13, 2011 (BUSINESS WIRE) -- Forbes magazine has named Four Winds Interactive (FWi) one of "America's Most Promising Companies." The digital communications solutions provider ranks amid the top 20 honorees on the magazine's annual list of high-performing organizations, coming in 16th among 100 privately held companies. Continue reading Four Winds Interactive Ranks Among Top 20 on Forbes "America's Most Promising Companies" List. St. Paul MINN (PRWEB) December 07, 2011 With the introduction of two space-saving interactive display mounts designed for video, signage and touch-screen applications, Ergotron is broadening the opportunities for users to incorporate multipurpose displays into business, education and healthcare settings. Continue reading Ergotron Wall Mounts Broaden Possibilities for Video, Digital Signage and Touch Screen Applications. i Display, an innovative Digital Signage solutions company, announces the launch of the new i View Android a revolutionary interactive retail digital display powered by the Android open operating system to provide a rich communication channel between brands and their customers. Continue reading i Display Announces New i View Android, a Revolutionary Interactive Point of Sale Digital Signage Solution. Samsung is taking pre-orders on the new MS Surface. More compact and with developer libraries. Nice writeup on Mashable. (better than Techcrunch). Continue reading Microsoft Surface Goes on Pre-Order. StayHealthy health monitoring units deploying in King Soopers. Feature overhead display with interactive station. Here is a picture of the unit. For all of the blogs, news sites and industry portals that service the digital signage space, there is scant little information about the one thing that's most important to the majority of buyers and sellers: pricing. In the past, we've tried to correct this imbalance to some small extent by doing an annual analysis of digital signage pricing. However, this only covered the cost of components and services for operating a digital signage network. Continue reading DOOH Ads Sell for Average CPM of $12: Survey. This site is produced by Catareno.